Design Your own stunning pet memorial on REAL SLATE and have it shipped to your door! 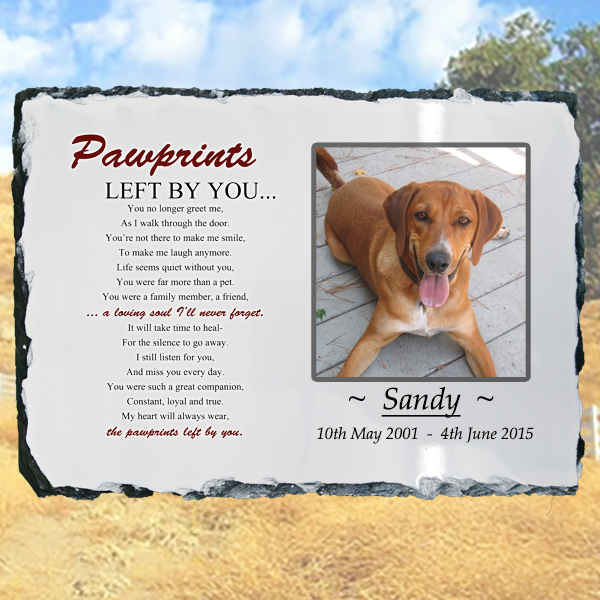 With our unique online designer you can create your own pet memorial just the way you want it (without any technical know-how). Just follow the simple step-by-step process and watch your design come to life. Once we receive your order we’ll use your design (but professionally edit any photos you use and make sure they look wonderful) and permanently print it direct to your slate using state-of-the-art Technology. We use only the highest quality inks and components which not only gives an amazing finish but ensures that your memorial can be used Indoors OR outdoors. Although we do recommend not placing in direct sunlight, your slate also has UV protection to help prevent fading. You can use any device to start designing your slate but you may find it easier on a PC/Laptop or tablet as smaller screens may be a little fiddly. I received my slate memorial plaque of my cat Sasha today we love it. Thank you john for your kind words and the great job you did. I will be passing your good work on to my friends and family thank you again. We received your memorial plaque in the post yesterday and it exceeded our expectations. This cat was a stray which had been around for some time but no-one new who he belonged to. He eventually came to our house in the winter and slept in the house every night and we would feed him. After several months my wife noticed he was looking unwell and took him to the vet, they said he had a serious heart condition and that he would have to have tablets. They found out he had been chipped and contacted his owners but they had not seen him for 18 months, he had been living rough for this time and they did not want him back. After a few weeks we thought he had not improved after having the tablets, my wife took him back to the surgery and was told his condition had deteriorated greatly over the past week when they had seen him last and he was now in pain. He subsequently had to be put down. We were devastated, he was only 4yrs old and had a very bad life. He was a beautiful cat with a really friendly nature especially considering the life he had led. We still expect to see him turn up outside. We feel really sad that we could do nothing to help him. We can’t explain why we should feel so deeply for a cat that was a stray, I think possibly it is because he chose us and not the other way about. We wan’t to keep him alive in our memories and your plaque is a fitting tribute. Once again I would like to thank you for creating something special for us and I am really glad I found your page on the internet. Brilliant service from start to finish love the plaque, very quick service and good communication I would definitely recommend. I purchased a memorial plaque after I lost my beloved Bruiser. I can’t state how happy I am with it. It is fantastic quality, I can’t stop looking at it. John is a lovely person to deal with and he was nothing less than compassionate and professional. I would highly recommend, and will certainly be buying more items in the future. I purchased a beautiful memorial stone for our beloved 15 year old Bichon who passed. Within 12 hours of placing the order, our beautiful stone was on it’s way. I was contacted immediately by the owner who sent his condolences and immediately sent me a proof of what the stone would look like. I honestly cannot praise this wonderful company enough! Thank you for your compassion and our beautiful keepsake!! I received my memorial plaque for my dads 2yr old pup Zeus who passed away on monday after being caught in a currant absolute tragic loss. John emailed quick after order was placed with his condolences to our loss and with preview of the plaque. I honestly cant get over how lovely the plaque is and how quick it arrived! John you are an amazing man helping families through such a horrible time. Have already recommended you to several people as i am so happy with service. This man John really is truly amazing at his job he is an angel in disguise if you ask me. He has such a lovely way about him to. My dog past away very suddenly on Monday. We are still devastated and grieving. I ordered a pet memorial plaque late one night. He emailed straight back the next day with a preview to see if I liked it. It was amazing I loved it. It arrived today it looks even better on the plaque it brought a tear to my eye it was that beautiful. It was here really quickly to i ordered it one day and it arrived 2 days later. I would definitely recommend to everyone and I would definitely get of ucase again. Thank you so much John I appreciate your hard work. I have just received my memorial plaque and was over the moon with it It was far better than I expected. I also received lovely words from John at this very sad time of losing my best friend Ben my dog. I am going to order some other items from him. Thankyou again John and wish you all the best in everything you do. We received our plaque today and are very pleased how it has turned out. We lost our german shepherd, Cassie, aged only 6, suddenly last month despite her having got over a big operation last Christmas. She was a beautiful gentle dog and was a massive part of our family. We bought the plaque to mark her grave in the garden and it is perfect – a lovely memorial for our special girl! Brilliant service and communication would definitely recommend and would use again! Many thanks. 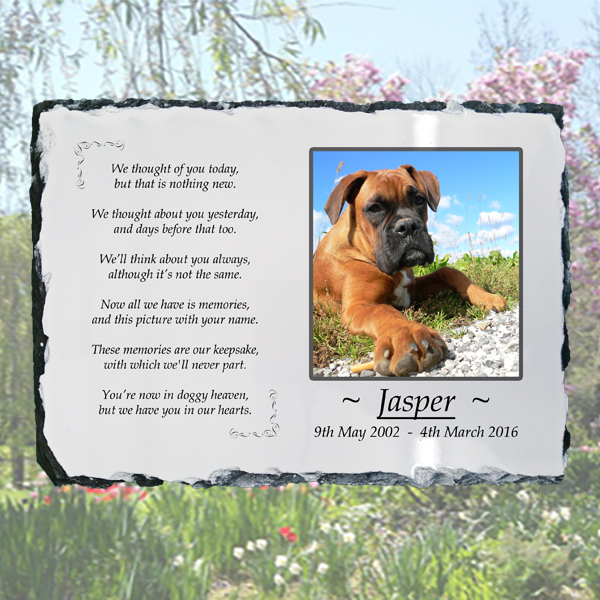 Purchased a Pet memorial slate – the service was quick, friendly and efficient. The plaque arrived promptly and is gorgeous. The image online doesn’t do it justice. Thanks John. Absolutely amazing product and efficient service from a lovely gent called John Reimann. We lost our 11 year old German Shepherd called Murphy and you have created a beautiful piece to remember him by, consisting of a lovely poem and picture laid onto a piece of slate. Thanks very much John, I would recommend your product to anyone and everyone. Fantastic photo memorial plaque, great communication and fast delivery! I looked around before I came across this business and couldn’t find anything as nice or unique as this one.